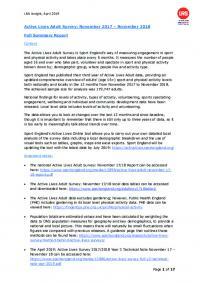 This is a local summary of the findings from Sport England's Active Lives Adult data (third year of data), providing an updated overview of adults’ (age 16+) sport and physical activity levels and volunteering engagement both nationally and locally in the 12 months from November 2017 to November 2018. 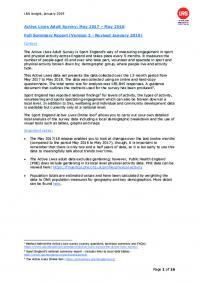 This report provides an updated comprehensive overview of adult (age 16+) sport and physical activity in England in the 12 months from November 2017 to November 2018 (third full year of data). 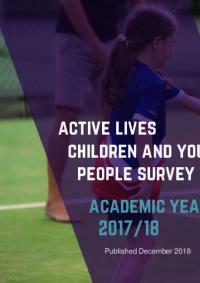 This report is Sport England's second release of their Active Lives Children and Young People Survey year 1 results (Sept 2017 – July 2018). 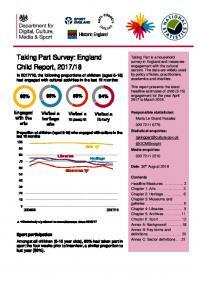 The data explores how children and young people aged 5-16 in England feel about sport and physical activity. This report is in addition to Sport England’s six-monthly reports on sport and physical activity and focuses on what drives behaviour amongst adults in England (aged 16 or above). The report presents data from the mid-Nov 2016 to mid-Nov 2017 release. 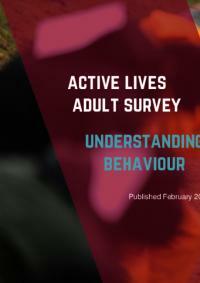 *Revised January 2019* This is a local summary of the findings from the first Active Lives Children and Young People Survey release (2017/18). 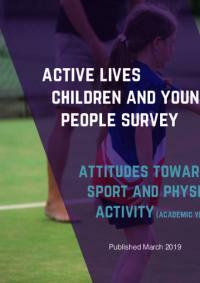 The summary includes an overview of children and young people's engagement in sport and physical activity (inside and outside of school), volunteering levels and outcome data. 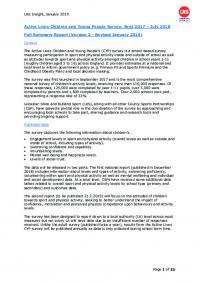 This is the first Active Lives Children and Young People report, providing a comprehensive overview of children's (aged 5-16 years) physical activity levels for the academic year 2017/18. 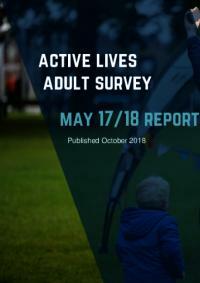 This is the fourth Active Lives report, providing a unique and comprehensive overview of adult (aged 16+) sport and physical activity in England in the 12 months from May 2017 to May 2018. 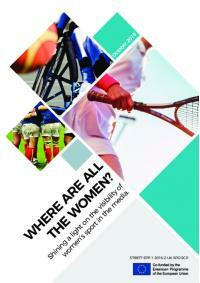 A report from research funded by the EU to identify how well the media represents women’s sport across the five countries and from this evidence base, challenge the current situation with journalists, broadcasters, and the sector as a whole, to understand how best to drive change. 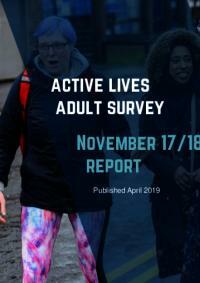 *Revised January 2019* This is a local summary of the findings from the fourth Active Lives Adult release. The summary includes an overview of adult's engagement in sport and physical activity, volunteering levels and sports spectating. The Taking Part survey is a continuous face to face household survey of adults aged 16 and over and children aged 5 to 15 years old in England. It has run since 2005 and is the main evidence source for DCMS and its sectors.